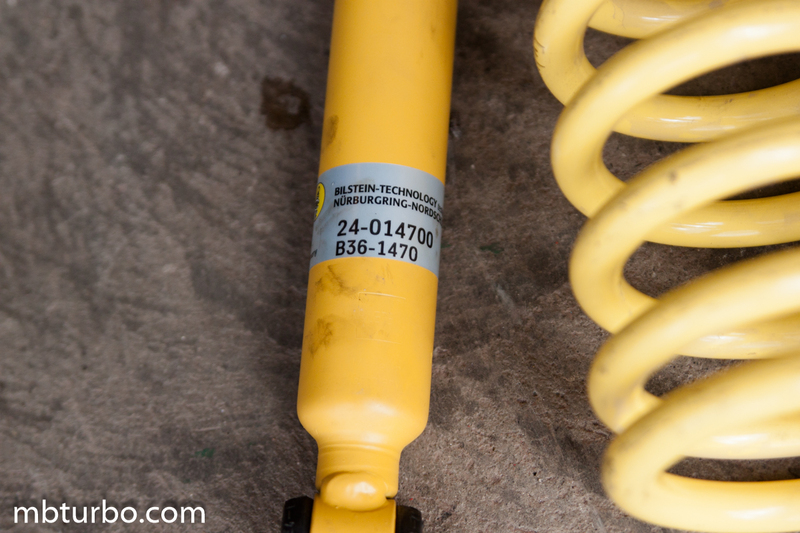 Got tired of the old worn stock shocks of the KYB brand, aswell as wanted to swap out the cut stock w124 rear springs. The stock w201 springs is in my opinion way to soft, even when driving normal, put two persons in the backseat and it will start to behave irrational on the road, aswell as sag enough to start to scrape against speedbumps, i bought stock Sachs w201 springs, and regretted it immediately. 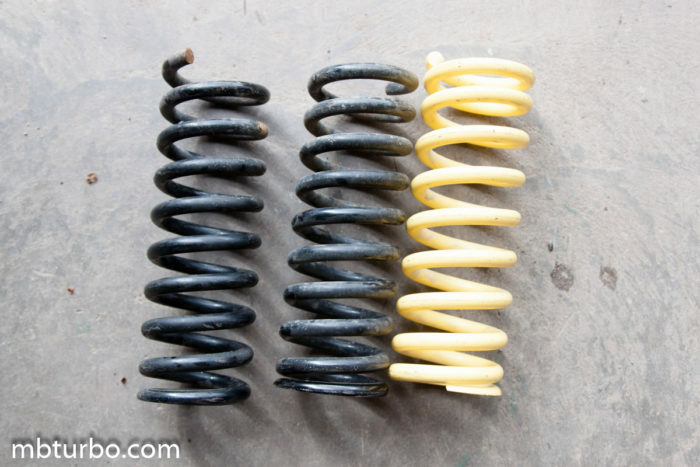 We decided to swap the springs from the w201 drifter to the 3.0 m103 equiped w201 that is driven a lot more. For fun we also compared the stock and cut w124 springs to the Lesjöfors aswell as the H&R springs. The H&R springs and Lesjöfors lowering had the same thickness (down to a few tenths of a mm) while the stock springs was about 1mm thinner if i remember correctly. Colorwise we should have swapped for the H&R but since they wasnt ours we went with the Lesjöfors. Car sits completely different and is a lot more stable, did a testrun before also swapping the shocks, and you could feel the dampers struggling for their life to handle the increased springrate. With the bilstein B8 dampers in place, the car was a whole new ride, yes, you can feel the bumps when driving at 70km/h, but at 120km/h + the dampers seem to just absorbe any bump or change in the road perfectly, it handles and rides a lot better at speed, althou, cruising around in the city the speedbumps is a bit more obvious althou not uncomfortable, since it isnt wobbling around anylonger.